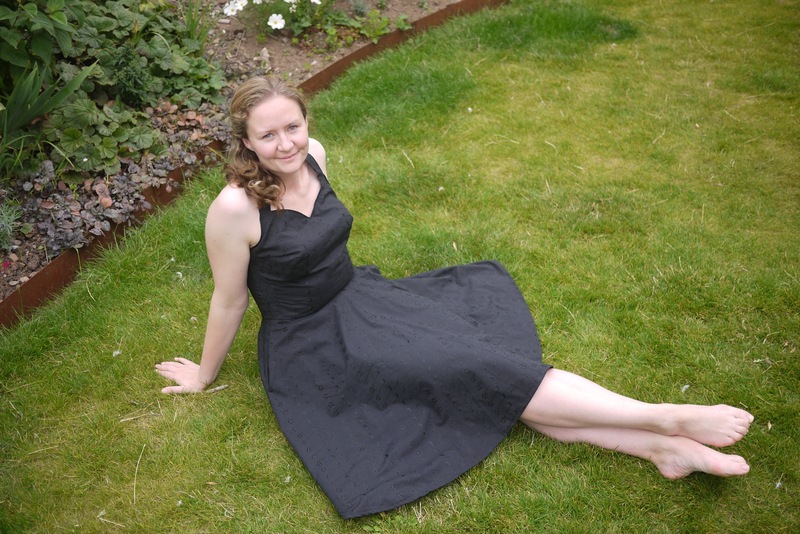 Three years ago, I made a black broderie anglaise (aka eyelet) dress for a friend’s wedding using Vogue V8725, view B. I had been hoping to get lots of wear out of it, but it turned out to be a bit low-cut for my strapless bra, plus I decided it made me look fat (!) So I’d only worn it twice altogether, and I spent most of that time hiding it under a jacket. 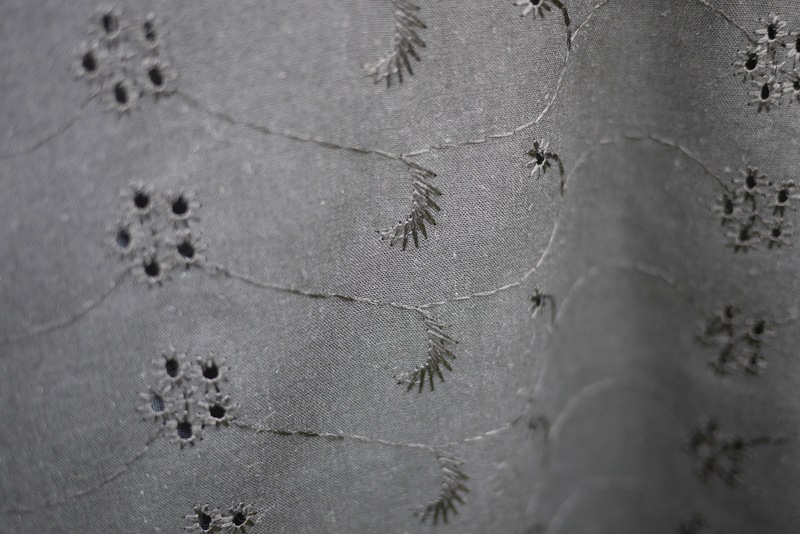 The broderie anglaise pattern in close up – although it’s actually black, not grey. This year, I thought I’d see if I could fix it. I’ve learnt a lot about the particular quirks of my figure since then, and I suspected that I’d probably made the wrong size. And indeed I had. I’d originally cut out a size 16 for the top, using the B-cup pattern piece. Since then I’ve learnt that my high bust measurement is misleading, and I actually need to make a size 14 with a 2-3″ FBA. So this time I used the D-cup bodice front and cut out a 14, grading out to a 16 at the waist. Then I lengthened the front bodice by 2″ (all added at the bottom, since it’s effectively a strapless dress) and adjusted the back bodice to match. 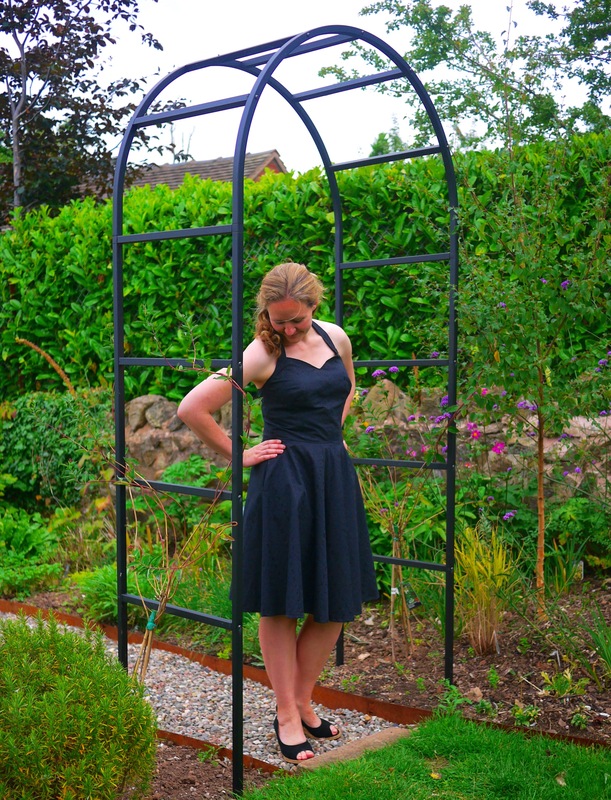 I was a bit short of fabric, so I had to cut the front bodice in two pieces, adding a seam at the centre front. It all went together swimmingly – I ripped out the zip and replaced it with an invisible one – my first one, because I didn’t have an invisible zip foot for my old machine. It’s not perfect, but it’s a lot better. And it’s so much fun to have pockets for once. Then I tried it on again, and it was huge around the top edge because I’d forgotten to do my usual narrow back alteration. There was almost two inches of spare fabric under each armpit, and the dratted thing wouldn’t stay up. I was also worried that the bust darts were too long – making everything look a bit, er, pointy in that area. I like a 50s fit, y’know, but that was going too far. Aaaargh. I couldn’t face taking out my lovely zip work, so I just took it in under the arms and fished around under the lining to try to shorten the darts and fix the other problem. Then I top-stitched the bodice to hold the lining in place and shortened the centre back seam a little to help my sway back before putting it back together again. I think I could have removed even more from the centre back seam – you can still see a slight swayback droop here. It fits much better on the top now, and I feel I could jump up and down in it without if falling off. 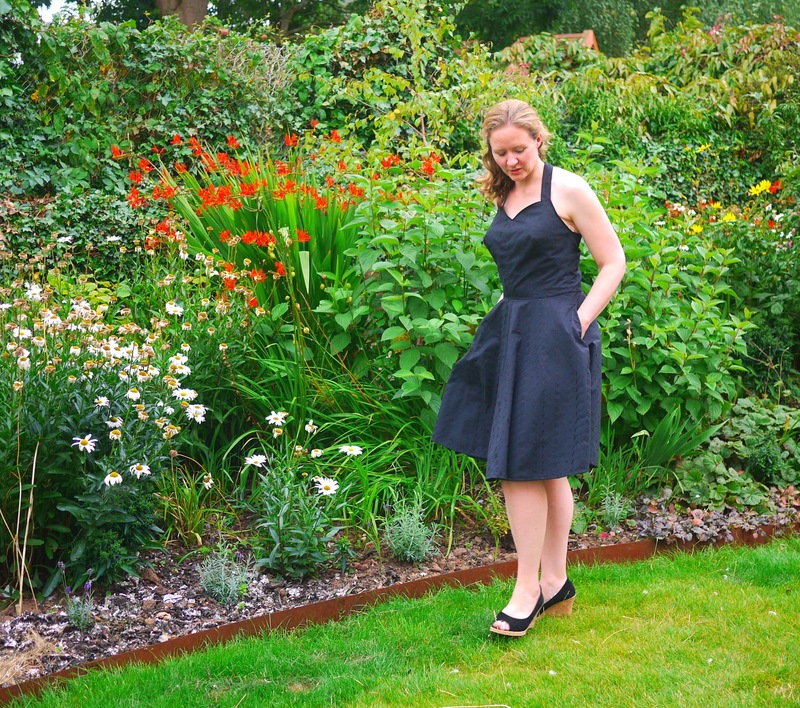 I had some finishing issues at the centre back – despite careful marking and stitching in the same direction my bodice ended up about 2mm higher on one side than the other. And my attempts to neaten it seem to have made it worse, not better. If you know of a great tutorial for finishing little corners like this neatly, I’d love to know where I’m going wrong. And I swapped the ordinary zip for an invisible one. Vogue classes this pattern as ‘very easy’. I’d say it’s very easy to make, but pretty difficult to fit. Have you made altered a previous make? Did it turn out as you hoped? Previous How do you find time to sew?